Found this Rockwell Delta Model 43-363 Shaper at a garage sale in Santa Rosa, CA. 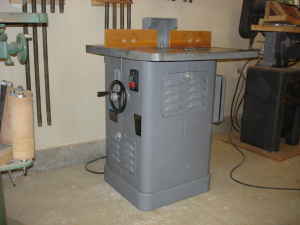 This shaper included a 2HP single-phase motor wired for 220 volts and included both 1/2" and 3/4" spindles. I am looling for an owners manuel for a model 43-363 shaper. I would gladly pay for a copy. I've got same model I picked up from a friend whose uncle used to have a cabinet shop. came with a whole box full of different cutters. I'm interested in converting tool holder to a collet holder for quick change operations. Am researching tool holder taper and type. Any info. would be appreciated. That's a nice looking unit.I'm pretty sure my Dad had one just like it.I was going through one of his tool boxes recently and came across 11 brand new assorted cutters in generic packages.They have a 1/2" bore and are 1" high.Is that size compatible with Rockwell/Delta?